Might be called Mini but produces maximum results! Need a quick, easy way to harvest your backyard nuts? We have the solution for you! 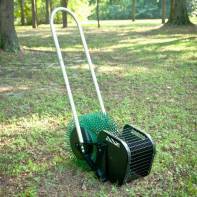 The Bag-A-Nut 8" Mini Roller is a quick way to harvest all sorts of nuts! Pecans, Almonds, Large Acorns, Small Acorns, English Walnuts, Macadamia Nuts, Sweet Gum Balls and Joba Beans. You have them? The 8" Mini Nut Picker Upper can grab them. How does the unique Bag-A-Nut design work? Just roll your Nut Roller over the nuts to be harvested. The wheel tines catch your nuts and, upon rotation, are emptied into the collection basket. Empty your collection basket to repeat your harvest. It really is just that simple. You'll never have to stoop low to pick up nuts. Aching backs and stained hands be gone! Size 3/8" to 1 1/4" is designed for Pecans, Almonds, and Large Acorns. Size 5/8" to 1 1/2" is designed for English Walnuts, Macadamia Nuts, and Sweet Gum Balls.